The Star of Kazan by Eva Ibbotson – After loving The Dragonfly Pool and enjoying Journey to the River Sea (reviews to come), I’m very much looking forward to reading another of Ibbotson’s children’s novels. This Austro-Hungarian adventure tale sounds absolutely ideal! 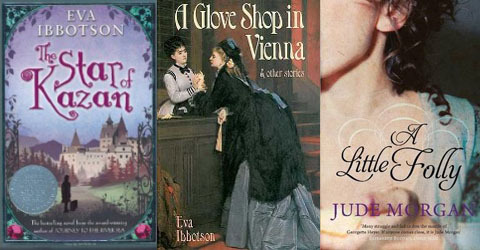 A Glove Shop in Vienna and Other Stories by Eva Ibbotson – more Ibbotson! I’ve read a few but not all of these stories before. A Little Folly by Jude Morgan – I’m actually rereading this for the second time this year (and maybe this time I’ll actually get around to reviewing it too). I enjoy all of Morgan’s Regency novels and this is my favourite of the lot. Perfect for those moments when you want a light, witty Regency tale but wish for something a little calmer than a hijiinks-filled Heyer novel. Jude Morgan is there at the library (several books!). Do I have time to sneak in one I wonder before Sunday? Hurrah for a well-stocked library! I also love “A Little Folly”! And Ibbotson, of course, though I’ve never read her children’s books – I’m glad to hear they’re good! I only just started reading Ibbotson’s children’s books last week but have really enjoyed them. It was a little strange to read Journey to the River Sea knowing A Company of Swans so well since they’re set in the same place at almost exactly the same time. I adored The Dragonfly Pool though: boarding schools, idyllic mountain kingdoms, idealistic children…it was the perfect adventure story with heart. I went crazy and bought half the library home, some specialised encyclopedias and a Jane Austen Coffee table book. Eva Ibbotson and Jude Morgan are both on my to read one day list! I love them both! Ibbotson’s adult romances are particular favourites. I haven’t read Ibbotson’s short stories, just her novels – but I’ve heard great things about A Glove Shop in Vienna – which shares a setting with my favorite Madensky Square. I’m not familiar with Ibbotson, but your words intrigue me. I”ll have to see what they are like. As you may know, I love reading children’s literature. What am I reading? Debbie Macomber’s Christmas in Cedar Cove. It’s light, pop fiction, and we are doing it for fun for our December book discussion. After a few “heavy” read, it’s actually just what I needed. Oh, Ibbotson is lovely. I adore her adult romances but these children’s books have also been delightful, especially The Dragonfly Pool. All three look good. Enjoy! I’ve been wanting to pick up one of Ibbotson’s books for a long time now–you’re inspiring me! Enjoy your books. Oh, I’m so glad! I love her books, for adults and children. I’ve been wanting to read A Glove shop in Vienna for SO long but I can’t find it anywhere in India. If you find an e-version,can you send it to me please? Sorry you’re having trouble tracking down a copy. 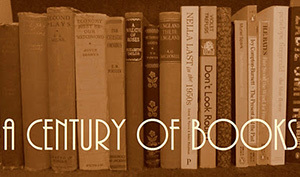 In the unlikely case that I come across an e-version (I loathe e-books and e-readers), I will definitely let you know! I too, have never read Ibbotson. Don’t know how that happened but I plan on rectifying that situation soon.